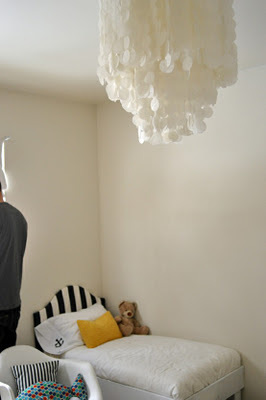 We are going for the romantic retreat in our bedroom- eventually, anyway. Right now the budget is tight, with baby on the way. 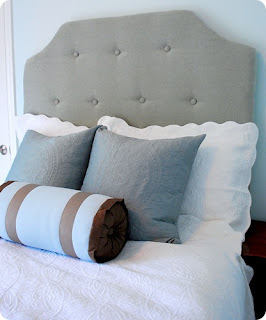 Still, I've been itching to do a padded headboard ever since I first saw a tutorial. Sara at "Running from the Law"
There are a ton of great DIY videos on Youtube as well. 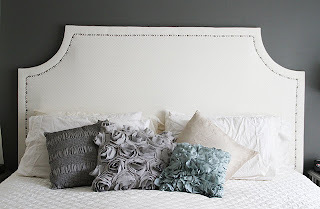 Basically, it is a pretty easy and inexpensive way to have your own custom furniture. I confess! I check Pinterest 3-4 times a day. I love seeing the creativity, to drool over the recipes and the beautiful pictures, and fantasize about my next project. It is inspiring and motivating- and since I've signed up, I've completed more projects than entire year previous. 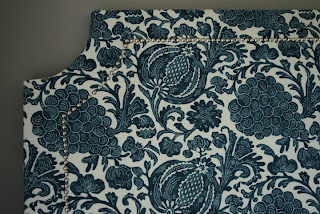 Any time I complete a pinned project idea, I try to comment about what I learned. This way my pin board is also becoming a check list. 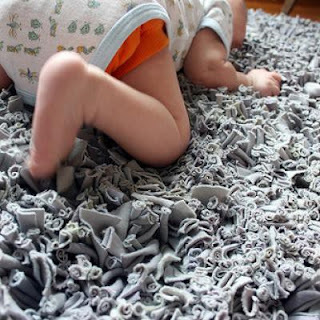 A jersey rug- once I decide what color to go with for the nursery. Is white asking for trouble? So, if you are looking for inspiration, I highly suggest visiting Pinterest. If you need an invite, just let me know! The first sign I was pregnant was sore breasts. They grew, I bought new bras, which I promptly outgrew. For the first trimester, just get some inexpensive sports bras at Walmart. After that, try to stick to inexpensive solutions until you get to the nursing stage. For the same reason, avoid pre-buying maternity tops. I got a lot of cute ones in preparation during the first trimester. What fit my chest then sadly no longer fit in the later two trimesters. Just wait until you actually need it and then go get the correct size. Maternity jeans are awesome and very comfortable, but there is more involved in pulling them up and down, which you do a lot with a baby bouncing on your bladder. I got a few pairs of comfortable pajama and lounge pants a couple sizes up at the thrift store for wearing around the house. 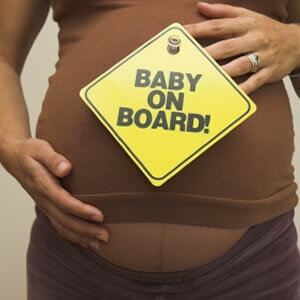 Don't buy anti-nausea solutions or any other pregnancy symptom helps until that symptom actually appears. A lot of symptoms you hear about you may never develop. Pregtastic.org podcasts are a joy to listen to when all you can think about is pregnancy, and no one else is interested in your new obsession. I listened to all 200+ in the first trimester. Pregnancy forums are also great, I use BabyCenter. My favorite maternity tops are the ones with high enough necklines that I don't have to wear a layer underneath. It makes life much easier. When you develop road rage, start crying because your husband is neglectful, or get intensely irritated with strangers- remember that you are at a very hormonal time and this, too, shall pass. I wanted to buy the best and brightest for baby. I spent hours reading reviews of baby products on Amazon and picked out my top 1 or 2 choices for each item. We planned what would work for our budget in each category (feeding, sleeping, nursery, diapering, etc.). Sadly, this did not afford me the convenience of buying everything (or anything, actually) new. So we hit garage sales every weekend, thrift stores on sale days, and a seasonal consignment sale. I got every item on my wish list- down to brand and in 'like new' condition- for a tiny fraction of the price. Being on a budget doesn't mean you have to cut corners or sacrifice quality, safety, or condition. It just means you need to spend a little more time and constantly be on the prowl for bargains. It was actually fun, and, a great activity to do with Ben. Take everything with a grain of salt and do your research. Not supposed to eat unheated deli meats? When you research the actual risk level to you and the baby, you may decide that it is crazy low enough that it is OK to go head and eat a cold sandwich now and again. I just realized I have a little over a month before my siblings arrive for Thanksgiving. Time to put in place some must-complete goals to ensure a comfortable visit. 1. Finish painting the kitchen table. I've primed and recovered the seats, and that is where we've been for the last four months. Whoops! 2. Purchase a sectional or couch set for the family room. Easier said than done when you're picky and on a craigslist budget! 3. Deep clean the house. Lets face it, hasn't been done... ever. 4. Finish painting trim upstairs. 3 rooms left to go. 5. Paint Baby Girl's room. So, with such happy motivation, should be doable. The only one out of my control is finding the perfect sectional at the right price.